Remember Divine Love and Goodness?!! It's Real, it's not fake in this very fake world!! God Bless everyone including Donald Trump; let's include everyone in God's Blessing, all our Brothers and Sisters.... It's important on the Spiritual path to have goodwill towards All Beings, even those that are evil; but you don't have to give in or concede to their evil ways (we'll all have been there and done it in one lifetime or another!!). Sometimes evil has to be destroyed, for the good of the evildoer as well, but we can leave that to God!! So, let's not leave anyone behind, we'd only have to come back to get them later!! 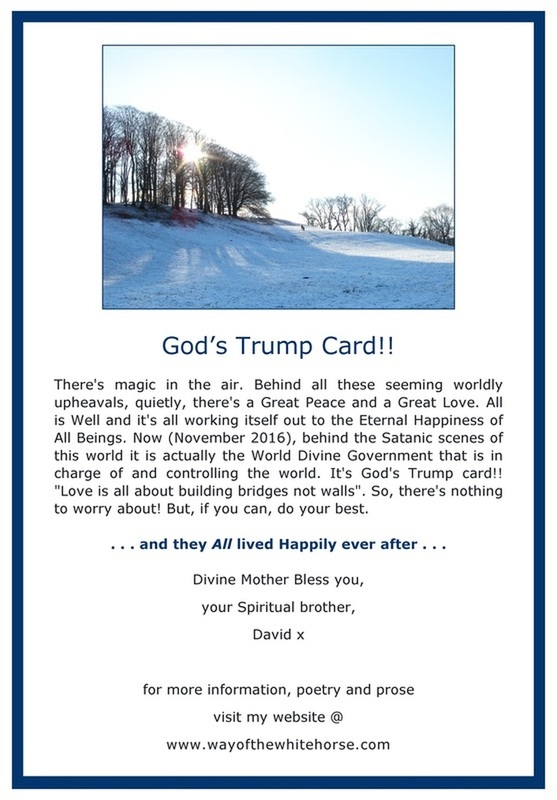 Divine Love and Kindness is the answer to all the world's problems, David.